Rev. Dr. Robert Lee (Bob) has served as our Senior Pastor since March 1, 2015. His personal mission statement is: 1) To be a faithful shepherd-leader (Psalm 78:72; 1 Peter 5:2-4); 2) To be effective and productive in ministry (2 Peter 1:5-8); and 3) To equip the saints for ministry (Ephesians 4:12). 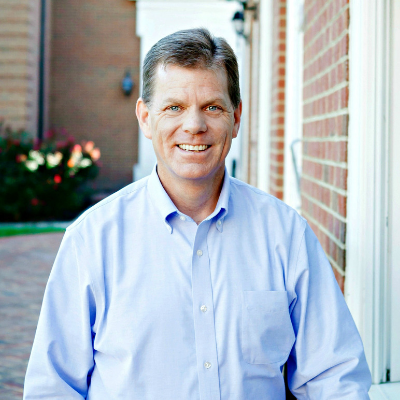 Bob previously served sixteen years as Senior Pastor at New Highland Baptist Church in Mechanicsville, VA. He is involved in Baptist life at the local and state levels, including past terms as both Vice President and President of the Virginia Baptist Pastor’s Conference. Bob’s family moved from Philadelphia to South Carolina when he was a child. He graduated from Winthrop College (now University) with a B.A. in Political Science. Upon graduation, Bob began his career as a claims adjuster with S.C. Farm Bureau Insurance Company where he managed the Orangeburg and Bamberg County claims offices. In 1990, Bob married Melanie, his college sweetheart, and they joined First Baptist Church Orangeburg where Bob began to experience a call to ministry. Several years later, Bob and Melanie quit their jobs, sold their home and moved to Richmond where Bob would begin the M. Div. program at BTSR. Bob graduated from BTSR in 1998 (M. Div.) and from Union Presbyterian Seminary in 2011 (D. Min.). While at BTSR, he served as an intern in the Single Adult Ministry at Richmond’s First Baptist Church. His areas of study included pastoral ministry and congregational leadership. Bob was both licensed and ordained to the gospel ministry by First Baptist Church Orangeburg, S.C. He and Melanie celebrated their 25th wedding anniversary in 2015 and they have one daughter, Isabella. Bob and his family live in Midlothian, VA. In his time off, he enjoys running, hiking, biking, reading and spending time with his family.